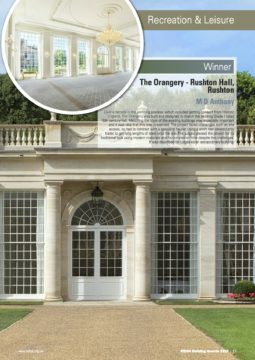 We are delighted to announce that our approved contractors MD Anthony Ltd received the award as winner of the recreation and leisure section 2019 for the stunning orangery at Rushton Hall Hotel and Spa which Hazelton Homes (Midlands) Ltd as the main contractor, projected managed. The orangery which was described by the judges as an “extraordinary building” that was built to match the grade 1 listed hotel using new materials, however, blending perfectly with its old surroundings. Rushton Hall was the home of the Sir William Tresham from 1438 when he bought the estate. In the 20th century the hall was converted into a private school until the Hazelton family acquired it and transformed it into the 4 star hotel it is today. The orangery is very popular with weddings, conferences and meetings as it holds a large capacity of 500 people who enjoy and make good use of the building.